On September 5, 1976, the Philippine International Convention Center (PICC) was formally inaugurated. Designed by Architect Leandro V. Locsin, a Filipino National Artist in Architecture, its construction was undertaken in a short span of 23 months. It was opened in time for the country's hosting of the 1976 World Bank-International Monetary Fund (IMF) annual meeting. Notably, PICC hosted the annual Awards Night of the Filipino Academy of Movie Arts and Sciences (FAMAS), the Philippine equivalent of the Oscars, mostly at its Plenary Hall. It also served as the home of the Office of the Vice President of the Philippines until 2005. 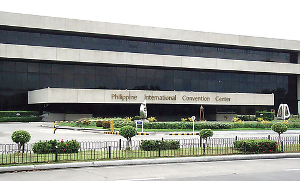 At present, PICC serves as a venue for national and international conferences, meetings, exhibitions, and other special events. It caters to organizers of international, regional and local events by providing highly advanced conferencing equipment and facilities and, most importantly, friendly, efficient and professional services.